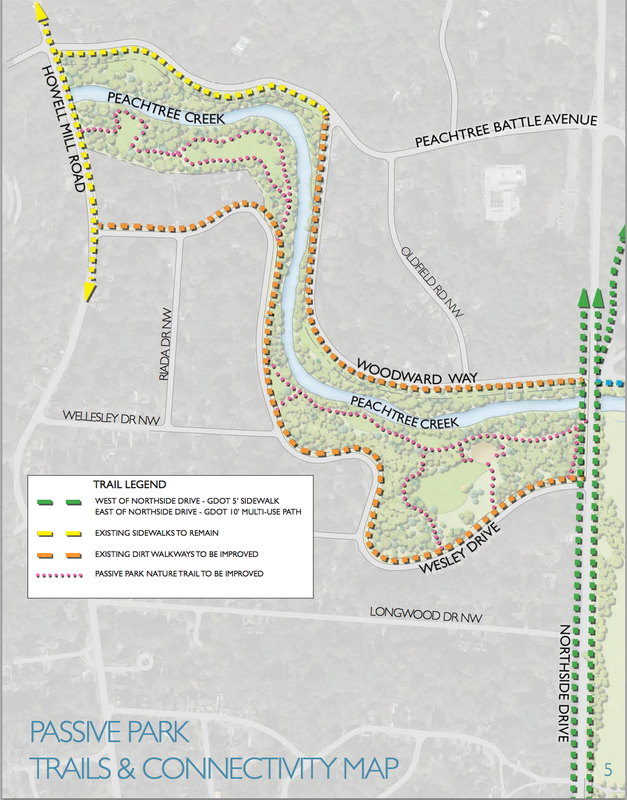 Atlanta – On Thursday evening, November 5, 2015, landscape design firm, Hughes, Good, O’Leary and Ryan (HGOR), presented the Memorial Park Walkways Project Feasibility Study Findings and Recommendations to the community at the Northside United Methodist Church. The presentation focused on the 35-acre portion of Atlanta Memorial Park, west of Northside Drive, commonly referred to as Memorial Park. Topics discussed included improving the nature trail system to make the park safer for pedestrians, assessing and preserving the tree canopy, removing invasive species/replanting native plants to ensure the ongoing health of the forest and wildlife, and addressing erosion, drainage and flooding along the trail system. Executive Director, Catherine Spillman, thanked Park Pride for awarding AMPC the $50,000 Legacy Grant to fund the study. The Conservancy raised matching funds from individual donors in the surrounding neighborhoods. Ms. Spillman noted that AMPC not only met the matching grant challenge but exceeded its $50,000 fundraising goal - raising over $55,000 from individual donors to match the Park Pride grant. Councilmember Yolanda Adrean discussed the recent flooding in Memorial Park. She thanked everyone for their patience as the Department of Watershed continues to address the sewage overflows and clean up the park. She also shared some background on the City’s flood mitigation efforts and observations on the benefits of connected, walkable neighborhood parks. Ms. Sluder commended these experts and others for contributing their time and talent towards this project to ensure that the findings and recommendations would be environmentally sensitive and in keeping with the passive feel of the park. She also thanked the City of Atlanta arborist, representatives from the Department of Watershed Management and the Department of Parks and Recreation who were available to answer questions and give feedback throughout the project. The existing trail system is in poor condition with exposed roots and rocks on the eroded surface, creating a hazard for joggers and walkers. Given the poor condition of the perimeter walkways, pedestrians run and walk on the street with vehicular traffic – a hazardous and dangerous combination. Settled stone curbing has caused erosion and drainage problems after heavy rainfalls. Invasive species such as privet and ivy threaten the ecological system and wildlife habitat. Ms. Sluder emphasized that HGOR’s analysis of these conditions and its recommendations were “based on site investigations, a thorough assessment of the topographic and tree surveys and a comprehensive review of costs, durability, maintenance, and best management practices for trail improvements within environmentally sensitive areas” as noted in the Feasibility Study report. HGOR’s recommendations came after 8 months of study with an emphasis on making Memorial Park safer for pedestrians while also preserving the forest in perpetuity. Improve the existing perimeter trail on Wesley Road and Woodward Way with a 5’ wide ADA accessible concrete sidewalk. HGOR recommended a landscape buffer between the curb and the sidewalk, where feasible.This recommendation is in keeping with the existing 5’ wide concrete sidewalks on the connecting streets of Howell Mill Road, Peachtree Battle Avenue and the new sidewalks being built by the Georgia Department of Transportation on Northside Drive. Improve the existing interior trail with a 5’ wide natural, porous material constructed of aggregate stone and slate scape stabilizer which will keep the trail in place during times of heavy rain or flooding. This natural trail surface is used throughout the region in similar environmental conditions along creeks, low lying areas and wooded forests. Prune dead limbs of trees that have branches overhanging the proposed trail, posing a hazard to park users. Ms. Sluder clarified that the discussion of raising the tree canopy should not be taken out of context and that the need for removing dead limbs is important in select areas where blocked views could pose a security issue such as near the playground where views are a necessity for child safety. Maintenance of these trees is essential and an arboricultural necessity for proper tree care. She emphasized that HGOR’s tree survey found only 5 trees (all of which were in poor health) out of the 871 specimen trees surveyed in the park that were in need of removal. Remove invasive vegetation identified by a forest restoration specialist along the banks of Peachtree Creek and within the surrounding passive park for the purpose of restoring native flora and fauna habitats that benefit the ecosystem. HGOR also recommended replacing with native vegetation as prescribed by the forest restoration specialist. The study recommended a 3 to 5 year mitigation program to ensure a successful native species restoration effort. In closing, Ms. Sluder shared the timeline for completing the Memorial Park Walkways Project, including estimates for construction document preparation and all regulatory requirements. A Q&A session followed with the professionals and experts listed above fielding questions from the audience.